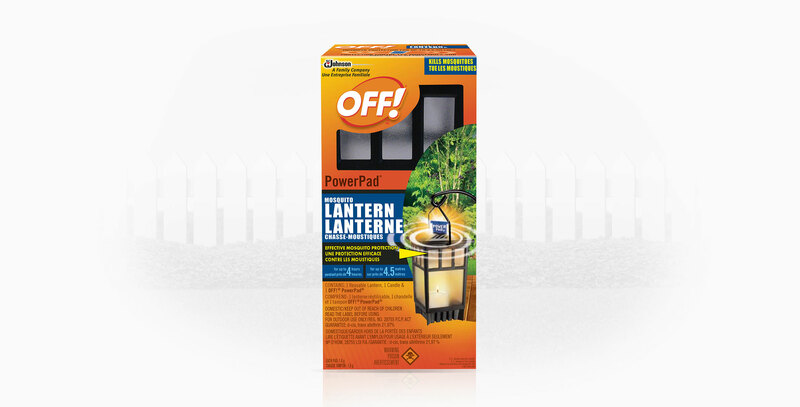 Protect your outdoor space with OFF!® PowerPad® Lantern. 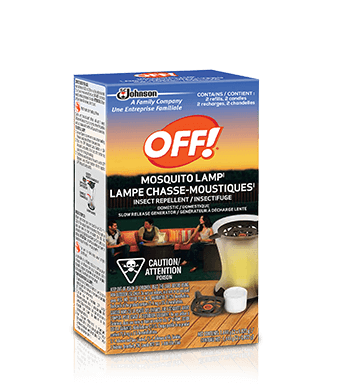 One PowerPad® Lantern kills mosquitoes from an average-sized patio for up to 4.5 metres. The heated pad releases insecticide that effectively kills mosquitoes for up to 4 hours. 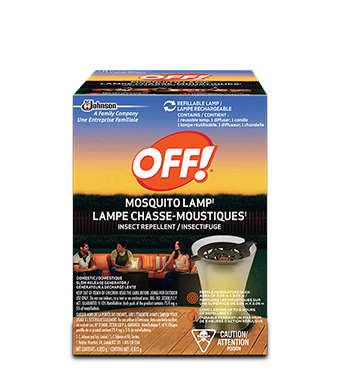 Kills mosquitoes for up to 4 hours. Offers protection for up to 4.5 metres. Use connectors to assemble rods. B. Push pole into stable ground. TEST TO ENSURE THAT POLE DOES NOT TIP EASILY. C. Locate lock tabs on unit base, press to release, and lower frame. D. Remove enclosed contents. Firmly press candle cup onto base post. F. Remove OFF! PowerPad® from package being careful not to cut, bend, or alter pad shape. Insert OFF! PowerPad® into middle slot on top. Pad is designed to taste bitter to help prevent ingestion. G. Raise frame base and snap in place. H. Move lantern only when cool and not in use. When finished using, carefully remove frame base and blow out candle. Pad is designed to last as long as candle. When not in use, store lantern and unused pads in a cool, dry, place inaccessible to children and pets. Prolonged storage of pads in outdoor conditions may decrease effectiveness. Securely wrap used pad and empty wrapper in newspaper and dispose with household garbage. Harmful or fatal if swallowed or inhaled. Do not ingest and avoid breathing vapours. Wash hands thoroughly with soap and water after handling pad. Do not use indoors, in a tent, or in an enclosed area. Do not touch the vented top while in use; it will be hot. Place on level, stable surfaces. This pesticide is highly toxic to fish. Do not apply directly to water. Drift from treated areas may be hazardous to organisms in adjacent aquatic sites. Do not use anything other than OFF! PowerPad® Refills in the unit. Pads may cause staining – avoid contact with other surfaces. S. C. Johnson & Son, Ltd. will not be held responsible for damage, injury, or poor performance caused by use of other insecticide pads or candles., NEVER LEAVE CANDLE UNATTENDED.